One of the first new plants I added to my garden after deciding to try this organic garden experiment was a single dill plant that I saw for sale at the local market. I stuck it in the ground with some fresh new soil and watched proudly as it quickly grew to a couple of feet in height. Then one morning I noticed lots of bright yellow aphids covering the stems. I might have been tempted before to grab the bug spray and put a stop to them, but I've never sprayed any of my herbs. I instead tried to wipe off (and squish in the wiping) as many of the little rascals as I could. Each time it seemed that I might be winning the battle, I would suddenly find lots more aphids. Then one morning when I went out for my usual routine, I noticed three ladybugs and a small praying mantis on the dill. I finally had reinforcements! For the next little while, the good guys seemed to be advancing on the bad guys, so I left them to do their job. 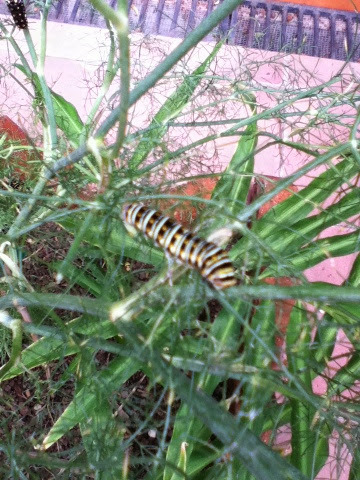 Then one day I noticed a bunch of strange-looking black and orange critters all over the dill. No more ladybugs and no more praying mantises and only a few aphids, but what what going on now? I carefully went over the plant and picked off each of the 10-12 critters along with the piece of branch he was sitting on, placing them in a small box that was handy. I set the box in the patio intending to 'deal with' them before I went inside, but I forgot all about them. The next morning when I went back outside, most of them had climbed out of the box but were still nearby. I began to gather them up to get rid off (squish) them, when I realized that something was nagging at the back of my brain. Could these critters be baby ladybugs? I went back inside to consult the internet and, sure enough, they looked just like the baby ladybugs in the pictures. Relieved that I hadn't killed my babies, I went back out and sprinkled them back onto the dill plant. I wanted all the ladybugs I could get! After a few rainy days that kept me inside, I again went out to check on my babies. These things definitely weren't changing into ladybugs; they were now twice the size they had been and looked very much like caterpillars and were eating the plant, not the aphids. Once again, I picked all the caterpillars off my dill by cutting the bit of branch they were on. I stuck them into a bottle in preparation for anihilation, but, once again, I got curious. Back on the internet, I searched for photos of caterpillars that like to eat dill. My very own critters came up in one of the first photos. It seems that I had captured a bunch of developing swallowtail-butterflies-to-be! I was hoping to use the dill for some pickles, but I also was excited by the idea of growing a crop of swallowtail butterflies to pollinate the rest of the stuff I had growing. Of course, one plant isn't enough for all the pickles I hope to make, and the squirrel that showed up a few days earlier had eaten the tops off all the cucumber plants anyway, so I carefuly removed each caterpillar from the bottle and returned it to the dill plant. The caterpillars and caterpillars-to-be are all doing fine. The dill plant is still trying to grow faster than they eat. I don't see any more aphids, so I guess that battle is won for now. I hope I'm right and they will become swallowtail butterflies, and I hope they stick around and enjoy my garden. I'm sure this has been only the first of many such experiences as I learn to tell the difference between the good guys and the bad guys. Next time I will do my internet research before removing the critters in question. And may the good guys continue to win! Long time, no see. I like your tale of the dill.